A Catholic University has rescheduled an event featuring a Planned Parenthood speaker after pro-lifers expressed outrage over the event as well as the way it was promoted. According to reports, Pentlicky had planned to discuss her personal journey as a Catholic who became a “reproductive health care provider” (a.k.a. abortionist) but claimed she was not going to speak as a representative for Planned Parenthood. The event angered several Catholic pro-life leaders. John Pisciotta, director of Pro-life Waco and founder of Hometown Pro-life Action Facebook page, says the promotional flyers for the event were “blasphemous” because they showed a rosary with an IUD in place of a crucifix. 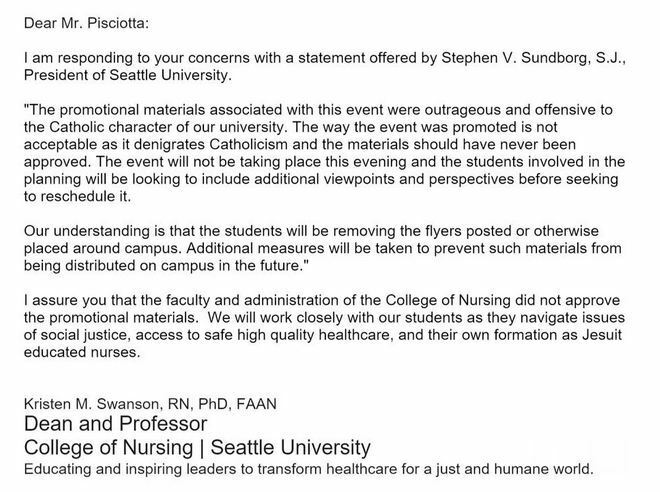 Pisciotta told Live Action News that after contacting the university, he received a response which he called “a partial retrenchment” telling him that the pro-abortion event had been postponed and the flyers were removed from campus. The promotional materials associated with this event were outrageous and offensive to the Catholic character of our university. The way the event was promoted is not acceptable as it denigrates Catholicism and the materials should have never been approved. The event will not be taking place this evening and the students involved in the planning will be looking to include additional viewpoints and perspectives before seeking to reschedule it. 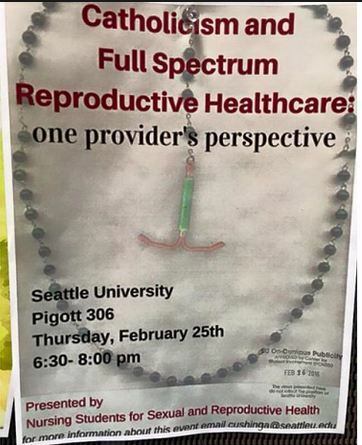 He admitted the flyer design was approved at some level of this “Catholic” university. The Jesuit president plans to help the nursing students deliver the event promoting abortifacient birth control in opposition to the moral standards of the Catholic Church. 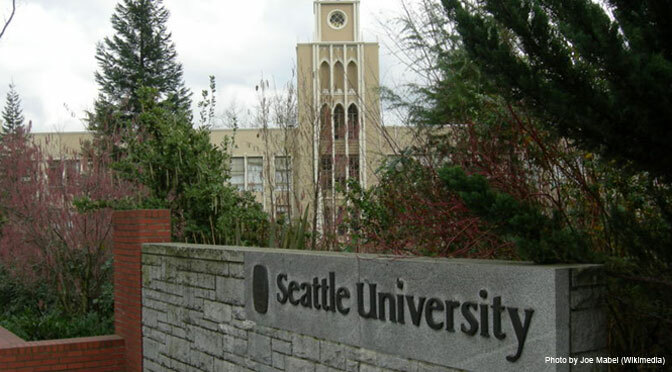 The Seattle Spectator described the outrage the school received from Catholics and pro-lifers around the country as an “avalanche of negative response.” In addition, a spokesperson for NSSRH told the paper that campus administration was receiving calls for their group to now “be expelled” and “disbanded” as well as prohibited from ever hosting any future events on campus. 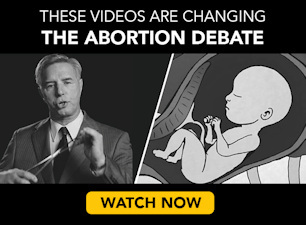 Whether or not the university will host this abortionist after all remains to be seen.